Clayton Carmack joined Moore Ingram Johnson & Steele in 1992 and is currently a partner in the Corporate and Tax Department of the firm. The focus of his practice involves business law, mergers and acquisitions, secured lending, securities law and intellectual property law. Clay was born in Dalton, Georgia on December 23, 1966, and was admitted to the Georgia Bar in 1992. 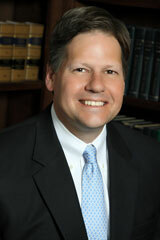 He received his Juris Doctor with honors from Mercer University in 1992. Clay earned his Bachelor of Business Administration degree from the University of Georgia in 1989. Clay is a member of the Cobb Chamber of Commerce, the Leadership Cobb Alumni Association, the Cobb Justice Foundation and the Cobb County Bar Association. In addition, he serves on the Editorial Board of the Georgia Bar Journal and is a member of the Corporate and Banking Section of the State Bar of Georgia. Clay lives with his wife Ellen, son Mitchell and daughter Mary Helen in Marietta. Clay volunteers in the community by coaching youth basketball and football. He also enjoys attending Georgia Bulldog games, golf, skiing and traveling.